US President Donald Trump has published a letter from Kim Jong-un, in which North Korea's leader voices hopes for a "new future" in bilateral relations. Mr Trump said the letter from Mr Kim (dated 6 July), was "a very nice note". But it made no mention of any efforts by Pyongyang towards denuclearisation - a key issue the two leaders discussed at June's historic summit in Singapore. Separately, the US has accused North Korea of violating a UN sanctions cap on refined oil products. It said this had been done through ship-to-ship transfers at sea using 89 North Korean tankers. The US did not say which countries were illicitly providing Pyongyang with the products. In December, the UN Security Council limited such exports to North Korea to 500,000 barrels a year. Trump-Kim summit: What did it actually achieve? In another development on Thursday, North Korean officials failed to turn up for talks with a US team on the repatriation of the remains of American soldiers killed in the 1950-53 Korean war. What was in Kim's letter? The English translation of the four-paragraph document was tweeted by Mr Trump on Thursday. In it, Mr Kim says: "I deeply appreciate the energetic and extraordinary efforts made by Your Excellency Mr President. He also says that bilateral trust should be "further strengthened in the future process of taking practical actions". Mr Kim says that "the epochal progress" in promoting bilateral ties "will bring our next meeting forward". In publishing the letter, President Trump tweeted: "Great progress being made!" He did not elaborate. 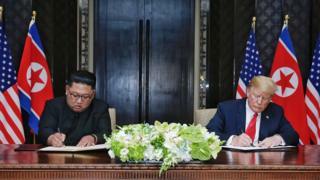 At the Singapore summit on 12 June, Mr Trump and Mr Kim signed a document that included a pledge from North Korea to rid the Korean peninsula of nuclear weapons. In return, Washington agreed to halt US military exercises in South Korea. However, critics have repeatedly said that Mr Trump has since failed to secure any firm commitments from North Korea toward the dismantling of its nuclear weapons. Last week, North Korea accused the US of using a "gangster-like" tactics to push it towards nuclear disarmament after a fresh round of high-level talks. A statement by an unnamed foreign ministry official gave a starkly different account from one provided just hours before by US Secretary of State Mike Pompeo, who attended the talks. Mr Pompeo had said progress was made during his two-day visit to Pyongyang. The date of Mr Kim's letter suggests it may have been sent before Mr Pompeo's visit. What about the planned repatriation meeting? It had been expected on Thursday at the inter-Korean truce village of Panmunjom. North Korean and US teams, as well as UN officials, had been due to discuss the details of repatriation. Mr Kim had agreed during the Singapore summit with President Trump to recover "POW/MIA remains, including the immediate repatriation of those already identified". 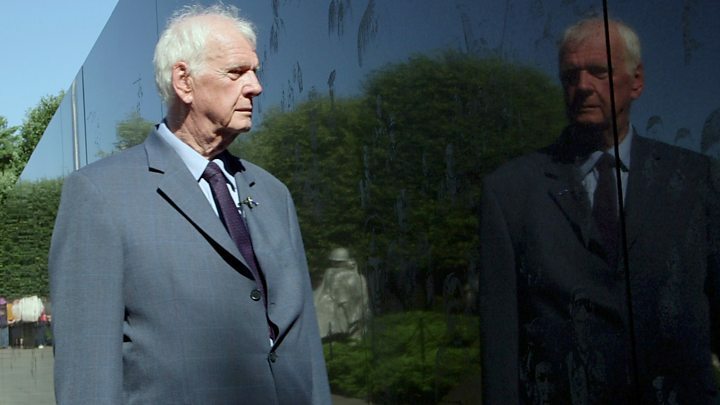 The agreement reportedly covered the remains of some 200 American soldiers. But North Korea's delegation failed show up. Pyongyang has asked the UN Command Armistice Commission to upgrade the talks to a higher level to include a US general, South Korea's foreign ministry said. The US later said that North Korea had offered to meet on 15 July. "We will be ready," US state department spokeswoman Heather Nauert said. An estimated 30,000 US soldiers died in the Korean war. There are about 7,700 US soldiers classified as missing in action in the war. However, recovery efforts were suspended when the relationship between both countries worsened, as the North began the advancement of its nuclear programme.